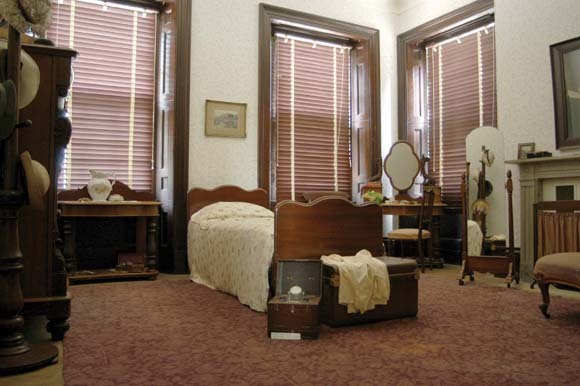 This bedroom is furnished much as it was in the Curtis era from the late 1940s to the 1980s. A picture of Miss Myrtle Curtis hangs above the fireplace. The fireplace surround is Marulan stone, which was popular at the time of construction. Its elegant design matches the architraves and rondels on the timber surround in the ballroom. The Misses Curtis were trained as beauticians, and an electrolysis machine, recalling this stage of their lives, is on display in the room.